I have been getting situated at my new place all Summer and it has been so much fun to decorate it with all of my antiques and things. It has been a slow and steady process and it is finally coming all together. One thing I really needed to work on was my bed. I had bed sheets that were great and all but none that really matched the decor of my apartment. I wanted something rockabilly, something fun to really make my bed pop and I found exactly what I was looking for when I discovered Sabbie’s. Now, I have seen a bunch of pinup printed pillows on etsy that were really over priced and a little much for my tastes but Sabbie had a great selection of amazing and fun rockabilly inspired pillows that were reasonably priced and so good, I didn’t know how to choose. If you like classic horror films, pinups, the day of the dead, classic cars, psychobilly, cherries, leopard, and loteria cards you have to visit her shop. I fell in love with her tropical pinup pillows and figured since I am a bit of a tropical pinup myself, that I would go with that theme and boy was I happy when they arrived. 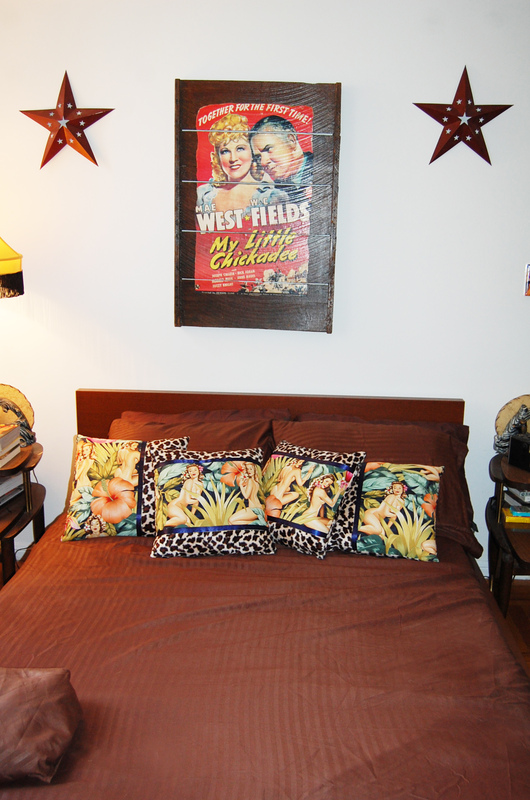 These pillows were the perfect touch to my bedroom and really tied my decor together. 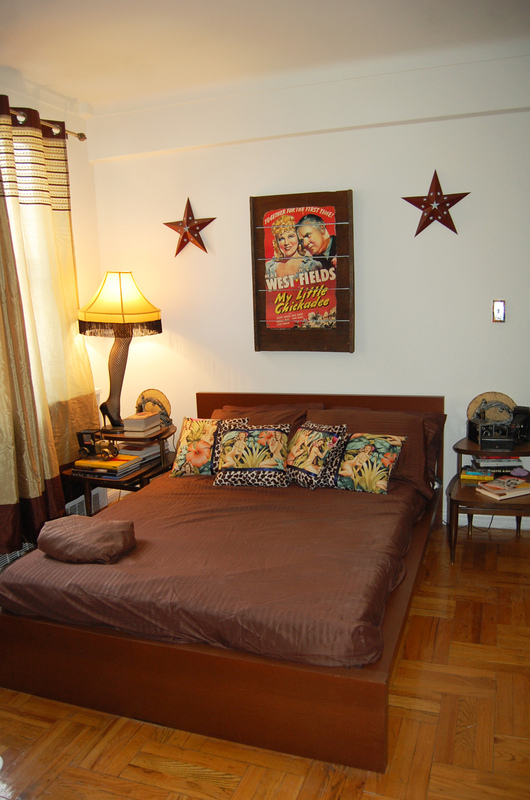 All I had to do was work around them and since they are so bold, I went with simple brown sheets. I absolutely love them and though they are throw pillows, they are comfortable and huggable, I sleep on them all the time. For any of you pinups out there looking to spice up your decor, Sabbies is your girl. She also makes purses, hair accessories, ipod/ipad sleeves, and more. 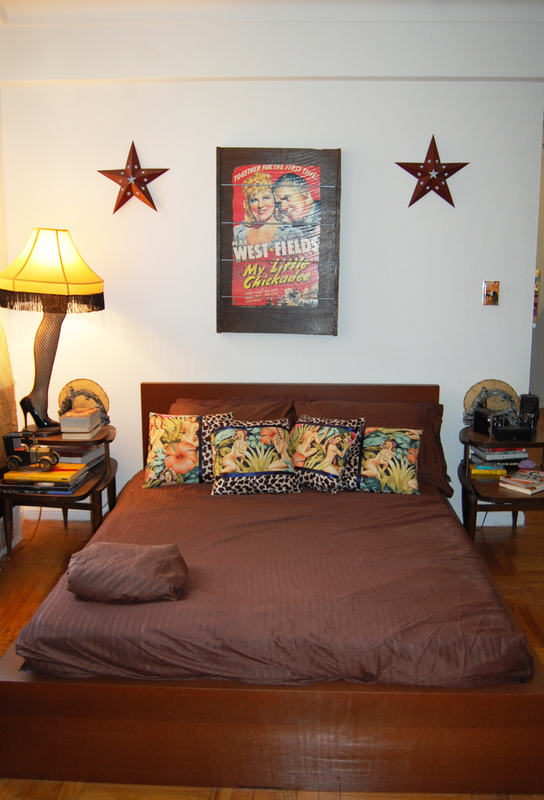 Get a closer look at Sabbie’s pillows and my bedroom decor inside. 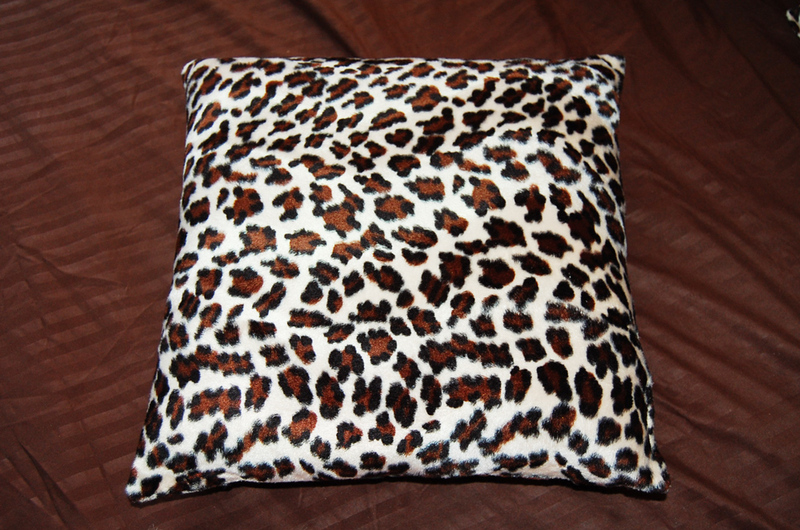 During my last pinup photo shoot, these pillows went well with my leopard Secrets in Lace ensemble. They make a great backdrop for shoots! This also gives you an idea of how big they actually are. I love the tropical pinup print with the leopard. They are so me! The pillows are just leopard in the back and incredibly soft. The perfect touch! I am waiting on finding the perfect mid-century brasilia bed frame at the right price but for now this Ikea Malm will do. Simple, timeless, and classy. Just how I like it. XOXO! Thank you Jasmin! Such a great post, and love the pics! You are such a doll! Love the pillows they are so beautiful. You matched them well in your photos. Great job! Thos are actually really great cushions! I love that the leopard print is so bright and pops like that. and i loooove the lamp!